The 1st Pennsylvania Light Artillery (43rd Pennsylvania Volunteers) consisted of nine batteries. One of those nine, Battery I, did not muster until near the war’s end. And among the batteries on the rolls for the end of the third quarter of 1863, two were consolidated with other batteries in the regiment. Colonel Robert M. West remained in command of the regiment, but was serving as garrison commander at Yorktown, Virginia. Battery A: No return. Captain John G. Simpson’s battery was assigned to Getty’s Division, Seventh Corps, at Portsmouth, Virginia. All part of the Department of Virginia and North Carolina. I believe the battery retained four 12-pdr Napoleons. 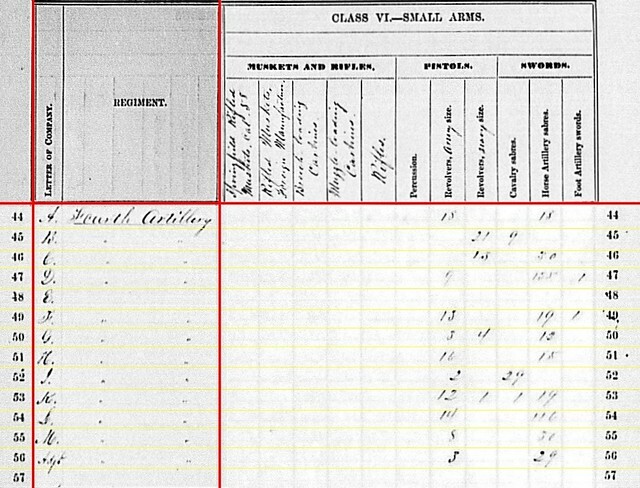 Battery B: Reporting from Bristoe Station, Virginia, with four 3-inch Ordnance Rifles. Captain James H. Cooper remained in command. And the battery remained with First Corps, Army of the Potomac. Battery C: At Maryland Heights, Maryland, with no artillery indicated. For the previous quarter the battery reported six 3-inch Ordnance Rifles. Captain Jeremiah McCarthy remained in command. The battery was among those transferred out of the Army of the Potomac in June, and assigned to Twenty-second Corps, Defenses of Washington, at Camp Barry. But the battery moved forward to Maryland Heights as part of Lockwood’s Division (Later the Maryland Heights Division), which by August was part of the Department of West Virginia. Most sources have this battery consolidated with Battery D on October 23. McCarthy was discharged on October 8. Battery D: Just an annotation of “Consolidated with Baty. 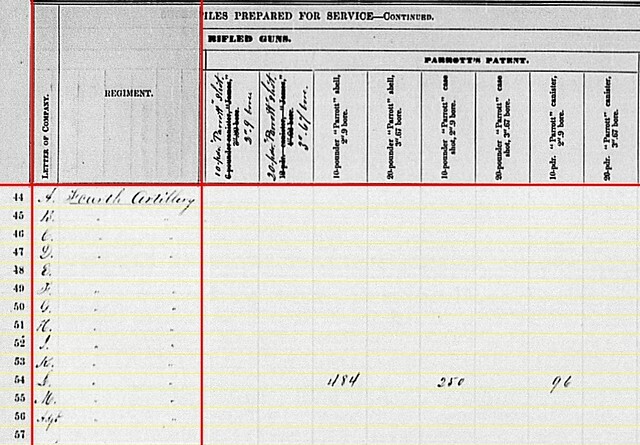 C.” Like Battery C, Battery D left the Army of the Potomac in June and was assigned duty at Camp Barry. In August, the battery transferred to the Department of West Virginia, and served at Harpers Ferry. Lieutenant Andrew Rosney was the ranking officer with the battery at that time. Battery E: At Williamsburg, Virginia with four 12-pdr Napoleons. Captain Thomas G. Orwig commanded this battery, assigned to the Yorktown garrison, Department of Virginia and North Carolina. Battery F: Indicated at Culpeper, Virginia, with six 3-inch Ordnance Rifles. Captain R. Bruce Ricketts commanded a combined Batteries F and G. After Gettysburg, the battery transferred to Second Corps’ artillery brigade. Battery G: The annotation “Consolidated with Battery F” tells the story. Although some sources considered this an “attachment” instead of consolidation. Lieutenant Belden Spence was the ranking officer remaining with the battery. Battery H: At Camp Barry, D.C. with four 12-pdr Napoleons. Captain Andrew Fagan commanded this battery, which arrived at Camp Barry in June 1863. The battery remained there through the spring of 1864, assigned to the Light Artillery Camp of Instruction. Battery I would not muster until March 1865, and thus escapes our attention here. Battery E: 176 shot, 64 shell, 192 case, and 80 canister for 12-pdr Napoleons. Battery H: 182 shot, 52 shell, 162 case, and 64 canister for 12-pdr Napoleons. Battery B: 127 canister, 34 percussion shell, 242 fuse shell, and 335 bullet shell for 3-inch rifles. Battery F: 120 canister, 120 (?) fuse shell, and 200 (?) bullet shell for 3-inch rifles. Those last two numbers appear faint, as if erased. So we must wonder if those quantities were “retracted” for some reason. Battery B: 79 shell and 18 case for 3-inch rifles. Battery F: 120 shell and 640 case for 3-inch rifles. Battery E: Eight navy revolvers and fourteen horse artillery sabers. Battery F: Eleven army revolvers, eight navy revolvers, one cavalry saber, and nineteen horse artillery sabers. Battery H: Fourteen navy revolvers and twenty-three horse artillery sabers. That wraps up a short discussion of what was a small regiment from Pennsylvania. But in addition to this regiment, Pennsylvania’s summary for this quarter included thirteen more lines. Those covered a battery from the 3rd Pennsylvania Heavy Artillery, eleven independent batteries, and an artillery section in the 11th Pennsylvania Cavalry. So we have more to examine before completing Pennsylvania’s section. 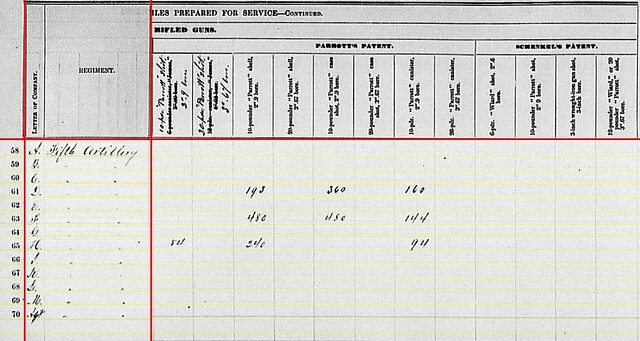 In the third quarter, 1863 summaries, the ordnance clerks allocated thirteen lines for the Fourth US Artillery. Of those lines, a full twelve were based on received returns. Battery E had no recorded return. Of the twelve recorded lines, all but three were marked received during the fall months of that year. 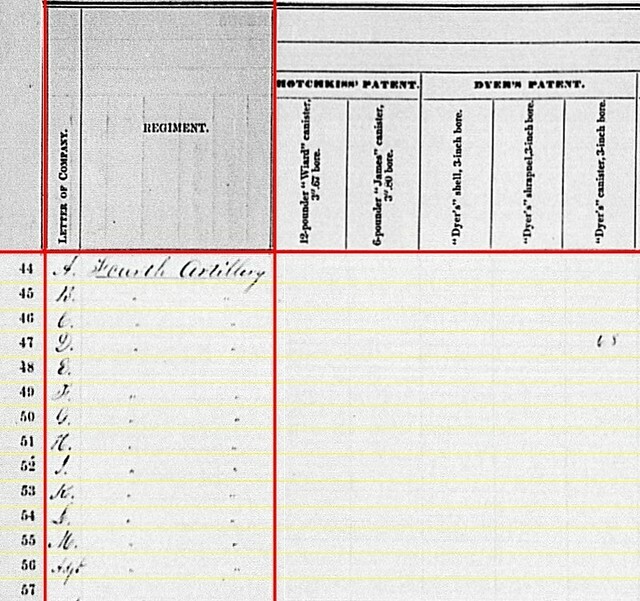 Three were not received until January of 1864. Thus, we have a relatively complete set of records to discuss. Battery A: Reporting, on October 28, at Gainesville, Virginia with four 12-pdr Napoleons. Following the death of Lieutenant Alonzo Cushing at Gettysburg, several different officers, and one non-commissioned officer, led the battery… some for just the briefest of battlefield moments. 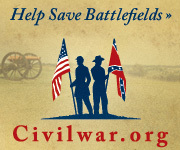 For brevity, I’ll cite Lieutenant Horatio B. Reed in command of the battery for the Bristoe Campaign. Two other significant changes took place after Gettysburg. The battery replaced its 3-inch Rifles with Napoleons. Further, in the weeks after Gettysburg the battery transferred to the First Brigade, Horse Artillery. Battery B: “In the field” with six 12-pdr Napoleons. The very capable Lieutenant James Stewart remained in command of this battery. And the battery remained in Colonel Charles Wainwright’s brigade, of the First Corps. So their “in the field” location for September 30 was Culpeper County. Battery C: Reporting at Washington, D.C (with a date of January 22, 1864) with four 12-pdr Napoleons. The location raises questions, as the battery remained with the Regular Brigade, Artillery Reserve. With Lieutenant Evan Thomas reassigned to staff duties, Lieutenant Charles L. Fitzhugh held command. 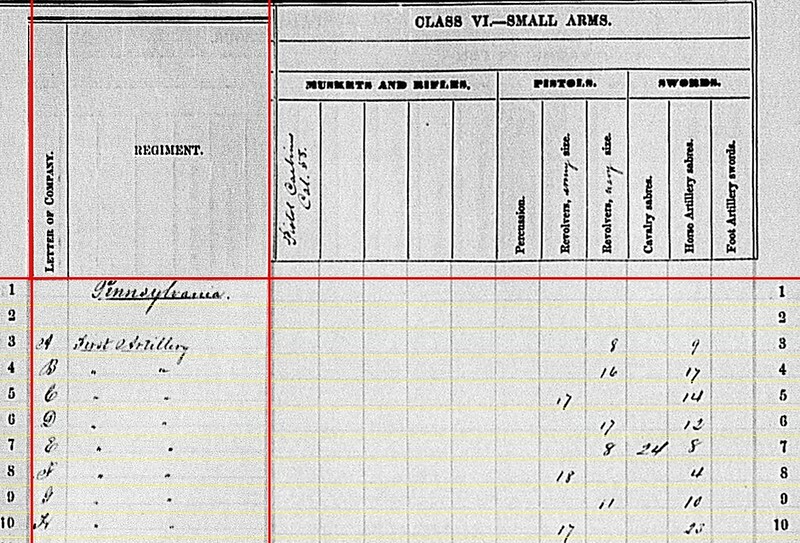 Battery D: Reporting at Portsmouth, Virginia with six 3-inch Ordnance Rifles. Captain Frederick M. Follett’s battery supported Seventh Corps. Battery E: No report. 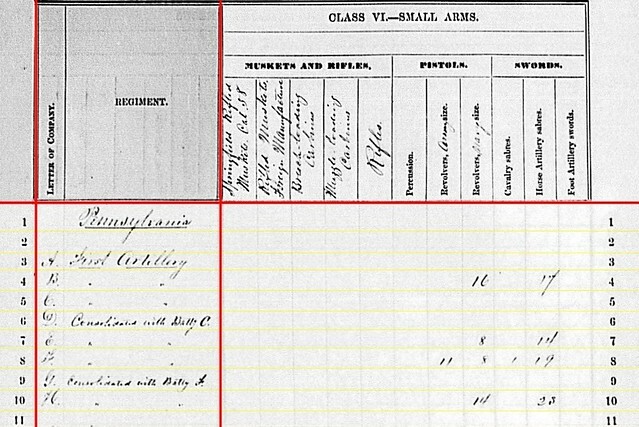 Lieutenant Samuel S. Elder’s was in the First Brigade, Horse Artillery assigned to the Cavalry of the Army of the Potomac, with four 3-inch Ordnance Rifles assigned. We can thus place this battery “in the field” and on duty along the Rapidan during those days before the Bristoe campaign. Battery F: Reporting, on December 1, at Stevenson, Alabama with six 12-pdr Napoleons. This veteran battery moved with the Twelfth Corps from Virginia to reinforce Chattanooga, in the aftermath of Chickamauga. Lieutenant Edward D. Muhlenberg, having been replaced in his role as Corps Artillery Chief, resumed battery command. Battery G: I like this line – Reporting on November 19 at Lookout Mountain, Tennessee with six 12-pdr Napoleons. Lieutenant Eugene A. Bancroft remained in command. Battery G supported the Eleventh Corps. As with Battery F, above, they were sent to Tennessee as reinforcements. If we interpret the reporting date literally, we can place the battery below Lookout Mountain. The battery would support an assault on the mountain five days later. Battery H: At Chattanooga, Tennessee with three 12-pdr field howitzers. 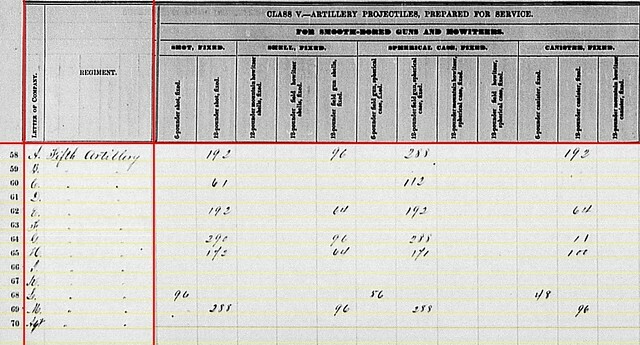 Lieutenant Harry C. Cushing’s battery lost a howitzer and many horses at Chickamuaga. And they expended a lot of ammunition. Battery assigned to Second Division, Twenty-First Corps. Battery I: Also at Chattanooga, this battery reported four 12-pdr Napoleons. Lieutenant Frank G. Smith commanded this battery, supporting Third Division, Fourteenth Corps. Smith reported leaving the field at Chickamauga, on September 20, with only six rounds. Battery K: Reporting at Culpeper, Virginia, with six 12-pdr Napoleons. The battery remained with Third Corps. Badly wounded at Gettysburg, Lieutenant Francis W. Seeley was recuperating. In his place, Lieutenant Robert James held command. Battery L: At Portsmouth, Virginia, with two 12-pdr Napoleons and four 10-pdr Parrotts. Under command of Captain Robert V. W. Howard, and assigned to First Division, Seventh Corps, in Southeast Virginia. .
Adjutant: Reporting at Fort Washington, Maryland. Of course with no artillery, but we will see an accounting of other arms and equipment. We don’t often consider the service details of the regular’s regimental headquarters, as those rarely figured into the field formations. However, with the adjutant mentioned, let us consider the duty of the 4th US Headquarters and Staff. At this time of the war, they were assigned to the Defenses of Washington. Colonel Charles S. Merchant, having served more than 45 years at that time, retired from active service. Colonel Horace Brooks, West Point class of 35 and with 28 years of service, took command. Battery A: 160 shot, 64 shell, 176 case, and 112 canister for 12-pdr Napoleons. Battery B: 192 shot, 192 shell, 288 case, and 96 canister for 12-pdr Napoleons. Battery C: 97 shot, 51 shell, 256 case, and 108 canister for 12-pdr Napoleons. Battery F: 288 shot, 96 shell, 288 case, and 96 canister for 12-pdr Napoleons. Battery G: 288 shot, 96 shell, 288 case, and 96 canister for 12-pdr Napoleons. Battery H: 221 shell, 234 case, and 116 canister for 12-pdr field howitzers. Battery I: 161 shot, 42 shell, 154 case, and 66 canister for 12-pdr Napoleons. Battery L: 96 shot, 32 shell, 96 case, and 32 canister for 12-pdr Napoleons. Battery M: 10 case for 12-pdr Napoleons; 54 shell, 48 case, and 30 canister for 24-pdr field howitzers. The uniform quantities reported by Batteries F, G, and K seem too perfect. Almost as if, perhaps, the officers simply estimated what they should have on hand, by regulation. But that’s just my speculation. 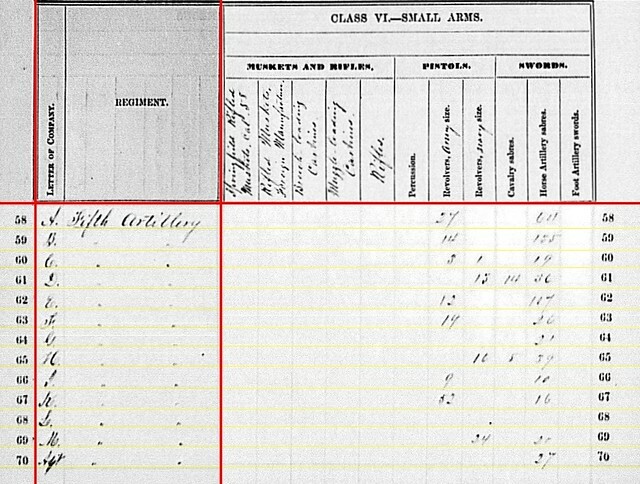 Quantities for Batteries H, I, and M (particularly the latter) seem to reflect expenditures in battle at Chickamauga. Battery D: 15 canister, 342 fuse shell, and 330(?) bullet shell for 3-inch rifles. Battery D: 68 Dyer’s canister for 3-inch rifles. Battery L: 484 shell, 250 case, and 96 canister for 10-pdr Parrott. Battery D: 100 shell and 155 case for 3-inch rifles. Battery A: Eighteen Army revolvers and eighteen horse artillery sabers. Battery B: Twenty-one Navy revolvers and nine cavalry sabers. Battery C: Thirteen Navy revolvers and thirty horse artillery sabers. Battery D: Nine Army revolvers, 135 horse artillery sabers, and one foot artillery saber. Battery F: Thirteen Army revolvers, nineteen horse artillery sabers, and one foot artillery saber. Battery G: Three Army revolvers, four Navy revolvers, and twelve horse artillery sabers. Battery H: Sixteen Army revolvers and fifteen horse artillery sabers. Battery I: Two Army revolvers and twenty-nine cavalry sabers. Battery K: Twelve Army revolvers, one Navy revolver, one cavalry saber, and nineteen horse artillery sabers. Battery L: Fourteen Army revolvers and 116 horse artillery sabers. Regimental Adjutant: Three Army revolvers and twenty-nine horse artillery sabers. The adjutant also reported thirty-one sword belts and plates. And once again, all government property was accounted for!